What does it mean to have an adventure? This blog has been dormant for so long. In part, because I thought my life had stopped being an adventure and became about a job. But this week I was awarded the most important grant of my career. That has made me think that maybe I have not been looking hard enough. I wrote an article in 2003 about the most important experience I have ever had in a museum. It was the evening after the Dunbar House re-restoration opening when I sat in the parlor with a half a dozen people and listened to Paul Laurence Dunbar's poems performed as the light at the end of the day faded. I think 3,000 people had come through the home, including the Secretary of the Interior, but in that that intimate setting I felt like the house became what it had always wanted to be, just a place where a poem could be shared with a few friends. In July, 2014, I had a new most important experience. My oldest son was married. But to say that he was married does not justify the experience. My oldest son was married in the first museum I designed and constructed. I can not even express what this means to me in terms of having had a career developing museums and historic sites. My son's fiance found a site on Pinterest that she thought would be the perfect place for a wedding. It was the church at the Ohio Village, a historic village at the Ohio Historical Society Museum. She had no idea that I had designed the interior and had managed the construction contract. The building won an Ohio Builder's Award, according to my resume my first award winning project. This was also my first project after being hired at the Ohio Historical Society in 1997. As a young idealist architect, I had no idea that the gas lighting, hand-rubbed wood finish, and three-tone mauve interior would be the setting for the best day in my son's life. But the backdrop was priceless. As I get older, I am constantly nagged by the perceived failure of my career and the fact that my friends have had so much more success than I have had. But in this one moment I have received a gift. 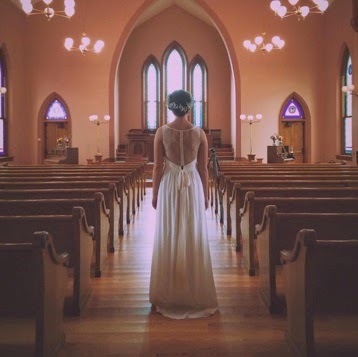 How could you ever expect that the circle of life would circle around back to this...your first daughter-in-law framed in the place she wanted to be married ...a place that you had created.